Never enough Naxos: Regular readers of this website will recall that we visited Naxos island twice last year and named it our Destination of the Year for 2013 because of its wide range of activities, sights and attractions and its wallet-friendly price appeal. Our list of 15 top reasons to visit Naxos has since become one of the most widely-read reports on the blog. Well, we didn’t get our fill of Naxos so we made a point to return for part of our two-week Greek holiday this spring. Below is the first part of an ongoing series of photo-illustrated reports about places and things we saw while we were on Naxos (later installments will feature our other two destinations, Syros and Athens). 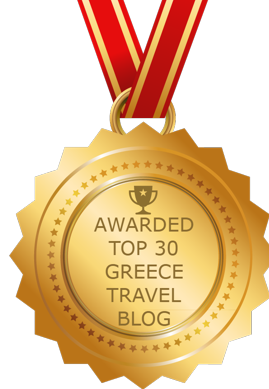 I will include some information about specific hotels, restaurants and other tourist-related businesses that were either open or closed since it could be helpful to anyone planning low season trips to the Cyclades. People frequently post questions in online travel forums, wondering if beach areas might be too quiet to stay at in May, and I’ve noticed the responses often give the incorrect and misleading impression that virtually nothing is open at the beginning of the tourist season. We arrived in Athens early in the morning of May 19 on an Air Transat direct flight from Toronto. It was our 10th time flying to Greece on this particular airline, and probably the best flight of them all — smooth and uneventful throughout the 9.5-hour trip. Athens was cloudy and a cool 12 degrees Celsius when we landed, and weather reports were calling for similar overcast conditions and also rain at Naxos and other Cyclades islands. The air felt warm with a touch of humidity when we stepped off the plane and walked to the tiny luggage claim room at the right-hand side of the small terminal building. By the time our bags came off the belt it was drizzling, and the light rain continued throughout our 10-minute drive to Lianos Village Hotel near Agios Prokopios beach. 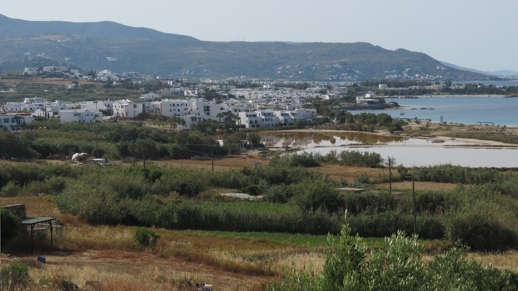 Please click on the number 2 in the link below to continue reading my report and view photos from our arrival day on Naxos. Nice report! Sorry to hear the weather was down, but happy it didn’t spoil your first day. Love the comment about the snails, I can quite imagine… Greece is so charming off season. Everything gets a bit more relaxed.